Please let us know how you did hear about us? Ever wondered what it feels like to fly? Or have you ever wanted to experience the rush and adrenaline of swinging eight metres above the ground and being caught mid-air? Welcome to Sydney Trapeze School, the one and only Indoor Flying Trapeze School in the heart of Sydney, offering Flying Trapeze Classes to the general public in a safe, fun and motivating environment. Located in St Peters and is walking distance from St Peters and Sydenham train station. 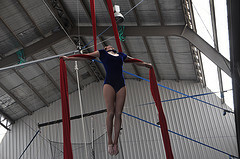 The trapeze school offers lessons in flying trapeze, circus and aerial arts as well as juggling. Sydney Trapeze School offers students the one-off-try as well as regular weekly classes for those fitness freaks looking for a new form of exercise. We cater to all levels. This activity is also great for Kids School Holiday Programs and Corporate events or parties.